In the issue (Volume 13 Issue 2) we present an interesting range of articles. First, we need to advise that our change to a publish when ready journal continues but we are still in phased transition based on software and technical issues. Apologies to authors and readers for these delays and we hope to be fully functional by the third issue this year. The Editorial in this issue Deals with the issue of the UN approach to sustainable Development Goals (SDGS) and how best to address health challenges resulting from factors associated with the impact of socio-economic determinants of health (SOEDoH). It raises the question of the managerial role in these contexts. In this issue Black and Fitzgerald provide a research article that further explores organisational climate and change through a social capital perspective. This subject is explored through the context of operating theatres and provides us with important learnings in this area. We continue to receive contributions from our colleagues in India. Returning to an Australian context Rogers and colleagues provides a research article that exams the impact of shared versus individual office space on therapist’s appraisal of their work environment. 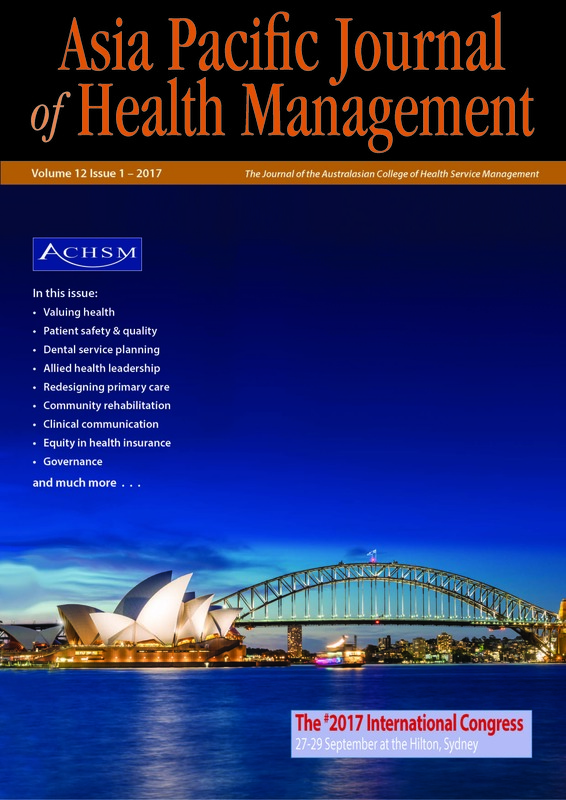 We conclude our contributions for this issue, at this stage with the contribution of Conquest and colleagues who in their research article describe a comparison across the Australian landscape of three payment scheme systems for public paediatric dental services and describes implications around access for those not closely located to available services. 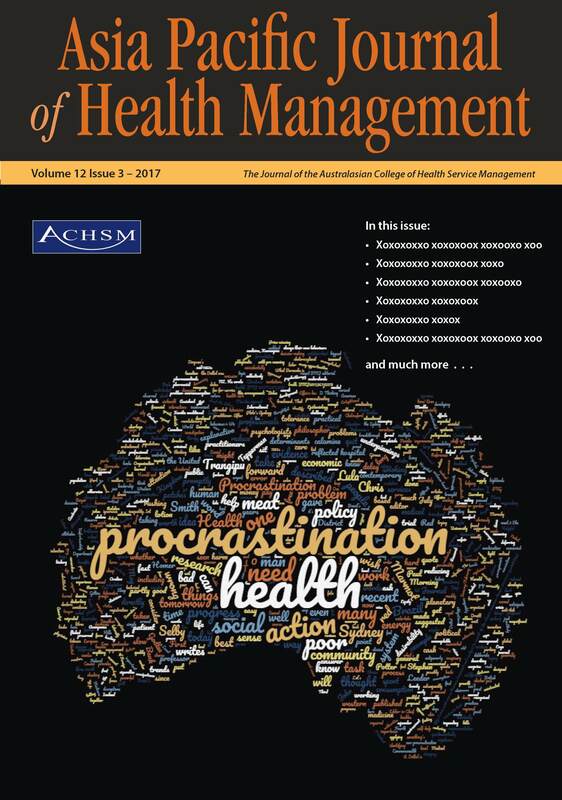 The cover for this issue is a word cloud taken from the invited and submitted Chris Selby Oration presentation from Emeritus Professor Stephen Leeder in 2017 with a clear emphasis on ‘procrastination and health’. The editorial in this issue examines Leeder’s topic and advances reasons why procrastination may have become habitual and how we might get past continuing to admire the problem and to make progress in effective health reform a priority. The cover design in this issue has a focus on an important aspect of a Professional College. The College Management Training Program has an extensive history of producing many established and current leaders in the Australian and international health contexts. 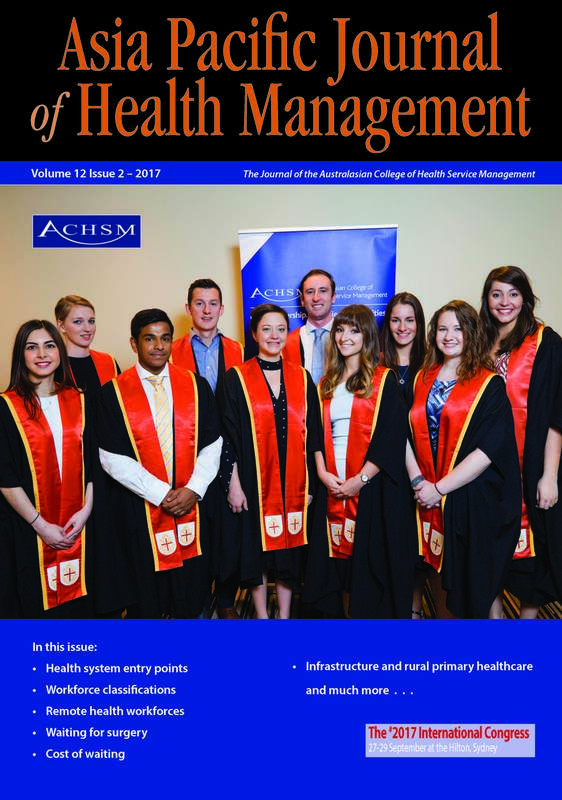 This cover depicts the Health Management Internship Program NSW Graduates 2016-2017. In this Issue, we present to you eight articles in total. Six articles are from colleagues in Western Australia, Queensland, New South Wales, Victoria and South Australia that address issues either of common interest across Australia, or that report on specific practices within a particular State that have a potentially wider application. In addition, we present an article from a colleague in India that describes an important issue for that country’s health system around health insurance coverage. We conclude our Issue with a descriptive and qualitative study from Bangladesh that goes to governance and decentralisation of health services in that country. 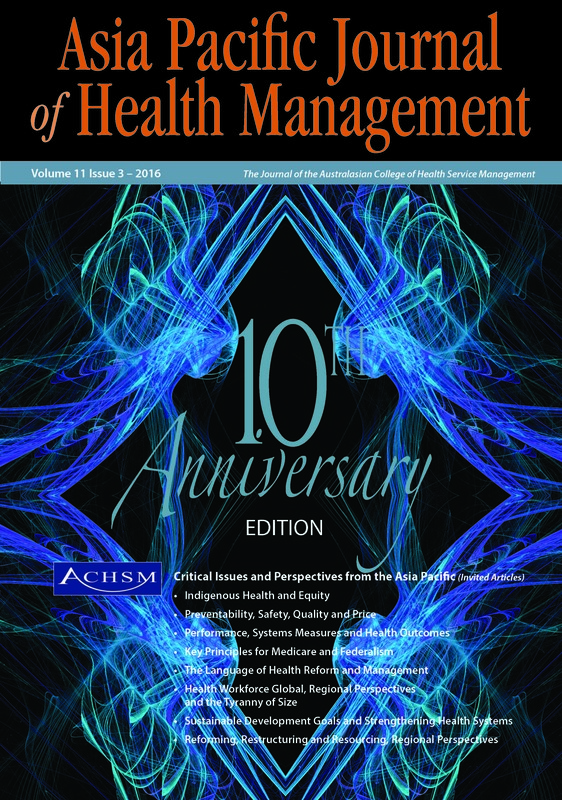 This issue represents the 10th year anniversary edition of the Asia Pacic Journal of Health Management (APJHM) that was established by the Australasian College of Health Services Management (ACHSM). Due recognition of those who contributed to the development of the Journal is expressed in the Editorial contributed by Bill Lawrence. To recognise and celebrate this milestone the editorial team agreed to publish a special issue anniversary edition. It was decided to be an invited article only edition around the theme ‘What problem is being solved? 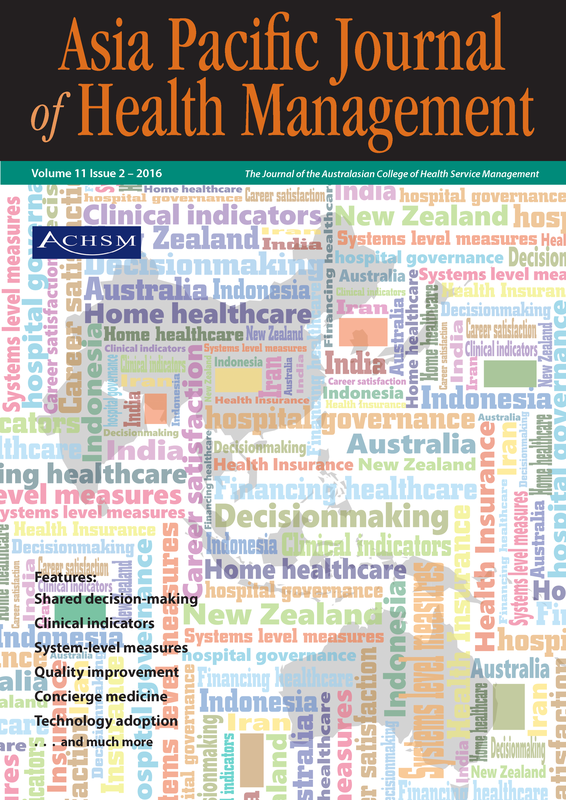 Critical Issues in health systems management’. This theme is an adaption of a similar challenge issued more than a decade before. 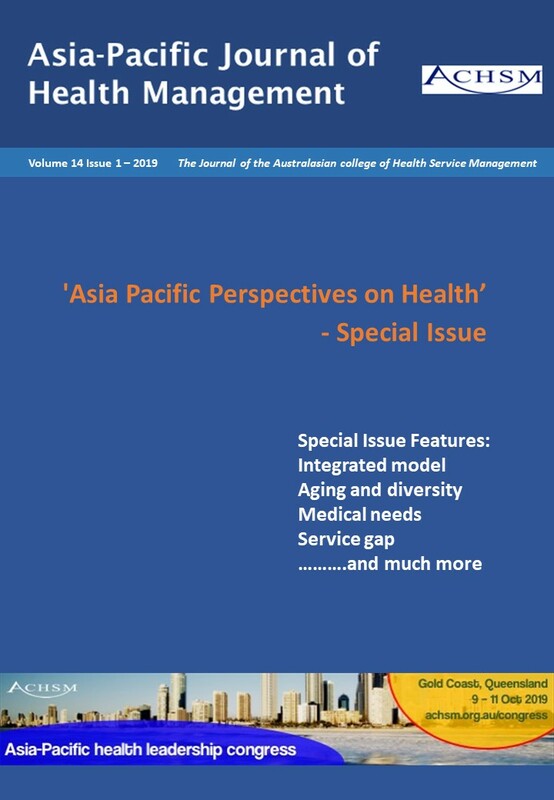 In this second Issue we present a range of articles from authors about health service and health systems management topics, on this occasion from across five different countries’ health systems in the Asia Pacific. We also report on a response from a reader to an article that appeared in the first issue, 11(1) of this year.